NO ATV'S, PETS OR FIREWORKS ALLOWED. 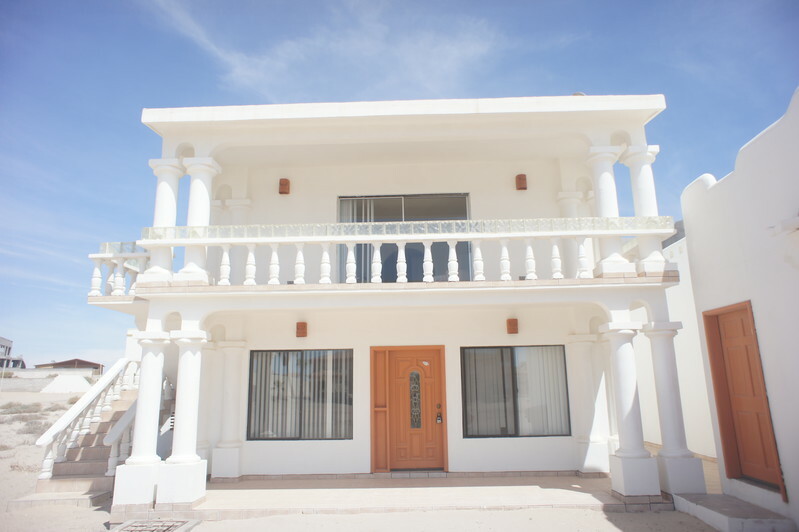 Condo Luna 1 is a beautiful condo home located one row back from the ocean in Playa La Jolla. This condo has 1 bedroom and 1 bathroom with accommodations for up to 6 guests. You can either rent the entire home or just this portion of it. The exterior is painted a bright white color with a balcony on the top and windows all the way around. The complex of Luna includes a swimming pool which is in very close proximity to this particular unit. The home has bright freshly painted white walls and sand colored ceramic tile flooring. The living room is furnished with two green and navy blue southwestern printed sofas. The larger of the two sofas pulls out to a bed for two of your guests. The room also includes a light wood coffee table, lighted end tables, and a 3 drawer media stand. The media stand is furnished with a TV/ DVD player. The walls of the living room are adorned with sunset art pieces and two sliding glass doors that open to the patio. The dining area is located in the kitchen and it has an oval shaped table with a green and white checkered table cloth that can seat 6 people. The kitchen is very large with green laminate counter tops, raised panel oak wood cabinets and white and black appliances. The kitchen includes all major appliances as well as some smaller counter top appliances like a blender, coffee maker, microwave and toaster. The cabinets are filled with pans, pots, glasses, dishes and bowls. The drawers are filled with silverware and serving utensils. The bedroom is furnished with two queen size beds both with matching pink bed spreads and black floral bed skirts. The walls of the room are adorned with complimenting floral art prints and there is a lighted bed side table between the beds. The room has a window with a view and a large double door closet where you can hang your clothing. The bathroom has a single sink vanity with a medicine chest mirror, walk in shower with a sliding door enclosure and a commode. The walls of the bathroom have complimenting wood framed art prints adorning them. The home is very close to the beach and the complex swimming pool. You could head to the pool and BBQ up some fresh seafood and then eat at one of the tables while you watch the sunset over the ocean. Walk down to the beach and take a swim in the ocean or go and explore the creatures in the tide pools. Let the kids bury you in the sand, build a sandcastle, or just take a long walk on the beach. You can set up an umbrella and lounge in the sun while you read a good book or go collect sea shells. Playa La Jolla is a wonderful place to have a very relaxing beach vacation. Be sure you have all the items you need because Playa La Jolla is a bit of a drive from town. Check now for rates and availability. Club House is not available, No swimming pool available.